And the story is unusual and compelling. This is a post-apocalyptic story of what happens when the war between the humans and robots is over and the robots win. The answer is extremely surprising and fascinating and complicated. The protagonist, Brittle, is an awesome robot. She is badass, self-serving, clever, and just plain fun. She is a scavenger who finds parts that other robots need to survive. But robot politics are getting in the way of her survival. Plus there is the other robot that is out to destroy her. But while it is wonderful to watch the world unfold through Brittle’s eyes and learn the history of the war through Brittle’s memories, it was the world-building that made this one rock. I adored the types of robots, how they were used, what became of them, what they chose to do with the world when they were in control, etc. The robot philosophy was interesting. I also thought it was clever that sometimes Brittle seemed very human in tone and then I would be reminded by another element that she was a robot. I believe that this was due to the type of model she was. There aren’t too many details above because I think all of me crew should experience this one for themselves. Just know that the writing is beautiful and it was time well spent. I look forward to reading the author’s other work. Sarah @ brainfluff – who introduced me to this one! Thanks matey! Now I normally post the blurb for the book here but I feel that this one gives the whole story away so I am not. It does sound really interesting! I love post-apocalyptic fiction but haven’t read anything on robots yet. Robots in minor roles, yup, but nothing that features them as main characters. I am intrigued now, thanks for highlighting it! Do share with the rest of us yer thoughts if ye do pick it up! Another good book ye might like in this vein is xom-b. I reviewed it somewhere in me log. That one needs more hype too. Wooots! AWESOME ROBOT? OKAY SOLD HERE. It’s nice to hear that the world building is nice 😀 ! I am interested in seeing what ye think of it. I am not sure how I have never heard of this one, but it sounds fantastic and maybe just the book to get me back into sci-fi. I am adding this. Fab review! Love the concept behind this one. The concepts were the most interesting even though I loved the story overall too. Hope it floats yer boat. Ummm I liked the robots so I say give it a shot. If they don’t make ye happy then abandon ship! That cover is beautiful!! I’m glad it was so good- very intrigued by it 🙂 Great review! Such a pretty cover! Very perfect for the novel in me mind. Ye going to try this one? It really is 🙂 I definitely want to! Glad yer interested in this one. So far me crew seems to love this. Join us! This is a cracking review – I entirely agree about the blurting blurb – and thank you for your kind shout-out, Cap! And yes – I’ll heartily endorse your recommendation – this is a wonderful read. YAY! Glad ye liked me review. Arrrr! I loved Dreams and Shadows so keep meaning to read this one as well. Glad you enjoyed it! Dreams and Shadows is now on me list. Glad ye loved that one. I will get around to it one day . . . 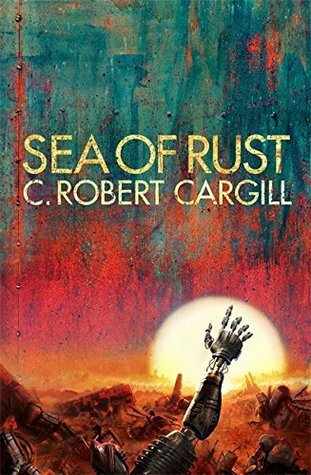 I thought this one was great and what I particularly loved about it, apart from excellent world building and managing to pull off a story with no humans at all, was the fact that basically, in spite of there being no humans, there was still war – like as though Cargill was basically saying that whatever rises to the top there will still be conflict. I thought the robots controlling the world and what they did with it was one of the best ideas. It surprised me, that’s for sure.